I would like to first state that I am extremely sensitive when it comes to discussing sharknadoes. Being from Kansas, I am far too familiar with the devastation that can be caused by sharknadoes, and don’t think it’s anything that should be made light of. So imagine my surprise when my DVR didn’t record a documentary, but the movie ‘Sharknado‘ that was straight-to-TV film for the SyFy channel starring Ian Ziering (‘90210‘), John Heard (‘Home Alone‘), and Tara Reid (famous for being a mess… and ‘American Pie‘). The opening sequence of the movie establishes that humans aren’t blameless, harvesting sharks for the fins to make soup. There are also mentions of global warming early in the movie, just to try and loosely create a morality tale within the story. 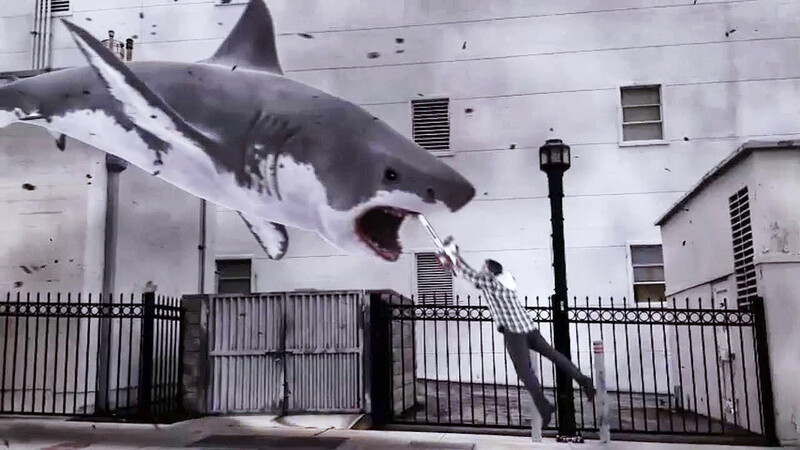 Now is a perfect time to discuss just what the hell a sharknado is. A hurricane (why isn’t the movie titled Sharkicane?) picks up sharks and water from the ocean and subsequently tosses them onto the land. After the hurricane floods LA with water and sharks, tornados then form to further fling the sharks inland (THAT is why it’s called ‘Sharknado‘). Ziering plays Fin, a bar owner who enjoys saving the day and surfing. He is separated from his wife April, played by Reid who just won’t listen and endangers herself and their daughter Claudia. It is debatable how “special” the effects in the movie are, but there are tons of CGI shots in the movie. There are sharks everywhere, and anytime a character in the movie seems to get complacent, a wave and shark immediately crushes and devours them. There are some issues from a story standpoint in the movie. The threat is immediately defined and doesn’t really change throughout the movie. There are sharks now where sharks weren’t normally, and they’re eating everyone in sight. Because the threat is static, they try to heighten tension with varying the victims (a school bus filled with children) or sharks jumping on top of things. There are a few inappropriate jokes as well, such as when the water is blood red there is a juvenile “looks like its that time of the month” reference. Also at around the midpoint of the movie the whole morality tale and character development is thrown out the window as our moral hero Fin busts through a police checkpoint and runs from the law for absolutely no reason, in a Hummer (screw the environment, there’s a sharknado chasing us). As ridiculous as the whole premise of the movie is, it gets absolutely absurd for the climax, and doesn’t hold back from just getting silly. 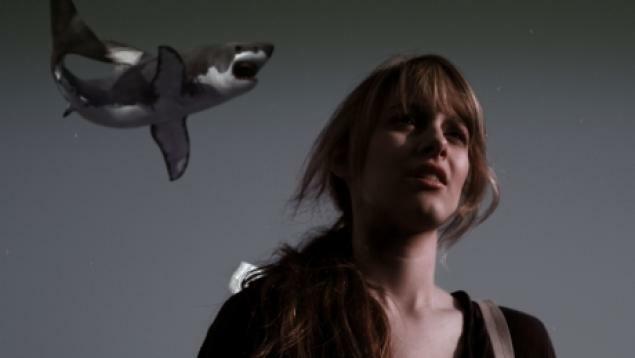 So how does ‘Sharknado‘ hold up? Overall, it’s passable as a Diamond in the Rough movie. It has all the elements of a “bad movie”, and maybe that is why it just isn’t great. Perhaps if there were more quotable lines my opinion would improve, but for some reason this one just doesn’t hit the mark. While it has the formula mastered with absurd plot, has-been casting, guns and explosions, it may just be too self-aware. This is one of those movies that you can have running in the background, and occasionally pay attention to, but I don’t think it will be that re-watchable. 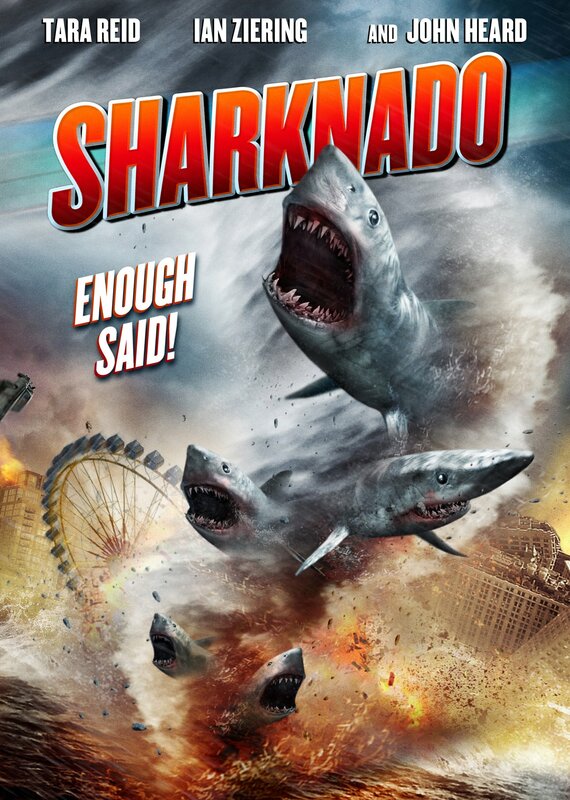 While ‘Sharknado‘ gets an ‘average’ review from me, for reasons unknown this movie captured the attention of the nation being referenced on all media and news outlets, including Fox News and CNN. ‘Sharknado’s‘ premiere on SyFy did great numbers for the channel, and because of that it has already gotten a green-light for the sequel. So what do you think? This entry was posted on Monday, August 5th, 2013 at 12:19 pm	and is filed under Film, News. You can follow any responses to this entry through the RSS 2.0 feed. You can skip to the end and leave a response. Pinging is currently not allowed. « Fernando Reviews ‘Crystal Fairy and The Magical Cactus’ With Michael Cera! !